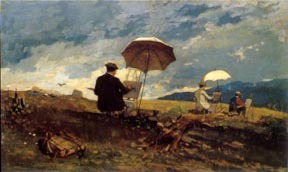 I often promote this topic in my outdoor painting classes, and thought it would be fun to investigate some of the history behind, as well as reasons for, the use of umbrellas for outdoor painting. With the resurgence of painting outdoors – “en plein air,” a tribute to the French artists who popularized it – in the last few decades, many topics have become widely discussed as artists share their ideas and approaches. Probably the toughest endeavor known to artists is painting outdoors, with all of the hazards it invites. Artists have always traded thoughts on the gear they use – what easel, which brushes, what type of surface to paint on, the best brands of paint and the particular colors they prefer. It tends to get rather technical, but can be very helpful for approaching outdoor painting. 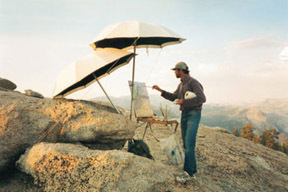 One item that is rarely, if ever, discussed is the outdoor artist’s umbrella. 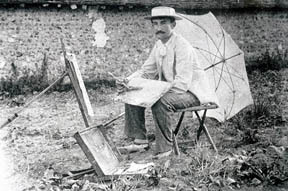 Usually only mentioned in passing, umbrellas should be given a much more important place in the accoutrements of the plein air artist. First and foremost, artists do not paint outdoors with the intention to copy Nature. (This could form a completely separate discussion – the influence of photography, television and movies on contemporary perceptions of what is “real.”) Instead, what artists are attempting to paint are the color relationships. There is no possible way anyone can paint what they actually see – because they are using paint, a very limited resource, to try and imitate light, which is incredibly vast. So the broader the range of colors you have on your palette, the better chance you have to paint those color relationships – akin to having more keys on a piano with which to play your notes. Would a pianist prefer to play a piece by Mozart with just six piano keys, or a whole piano? Color is a language that every human being speaks; it is the artist’s job to communicate. Here is the main reason for working with an umbrella outdoors – the artist is attempting to paint those subtle color relationships amidst a tremendous amount of light. If you’ve walked out of your dark house into the bright morning sunlight, you understand how much light there is outdoors when you’re forced to squint – because your eyes can’t handle the intense change. After spending a little time outdoors, though, we adjust to the intense light, and it starts to look “normal,” i.e. it doesn’t seem as intense as it did initially (this same phenomenon is true for a lot of other situations, too). The challenge is painting color relationships that will recreate light in all of its innumerable manifestations – and then bring the painting indoors where it will ultimately be viewed, still retaining that sense of light. 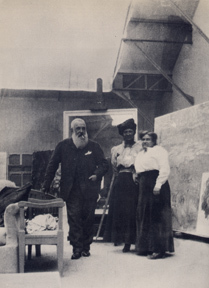 Claude Monet used a large white umbrella outdoors which recreated the soft lighting that he used in his studio (Figs. 1 & 2), both of which allowed him to control the light. Joaquin Sorolla used umbrellas and large shades (Fig. 3) – especially when painting on the beach. Many of his beach paintings show evidence that he was working from underneath a shade of some sort. Charles Webster Hawthorne (1872-1930) and Henry Hensche (1899-1992), both known for their color, used umbrellas. 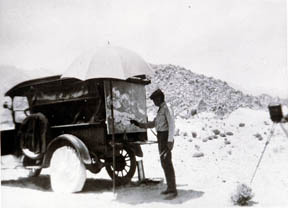 Alson Skinner Clark worked under an umbrella when painting in the California desert (Fig. 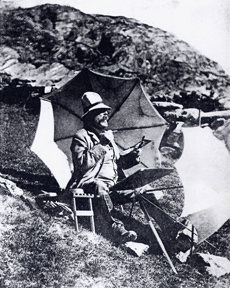 4) and John Singer Sargent used two when he worked outdoors (Fig. 5) in Switzerland. Besides photographic evidence, upon encountering these artists’ beautiful work in person, one realizes that they were obviously using umbrellas of one kind or another to control how they saw. The modern artist’s umbrella has improved – it still has a light exterior to reflect light/heat away, but now includes a dark interior to absorb reflected light/heat – allowing the artist to see their painting better, as well as keeping them cooler on hot days. (Other areas related to this are avoiding white palettes, and not wearing light or brightly colored clothing. Everything reflects!) The idea is to create the best situation outdoors in which to see your work, so that when you bring it inside, the colors are not dead. A translucent white umbrella outdoors does not block much light, so our eyes stay adjusted to the heightened intensity of outdoor light – and we paint too darkly. Though the photos above seem to feature primarily white umbrellas, they also appear to be much more opaque than today’s white umbrellas, whose main purpose seems to be giving the artist an even sunburn. 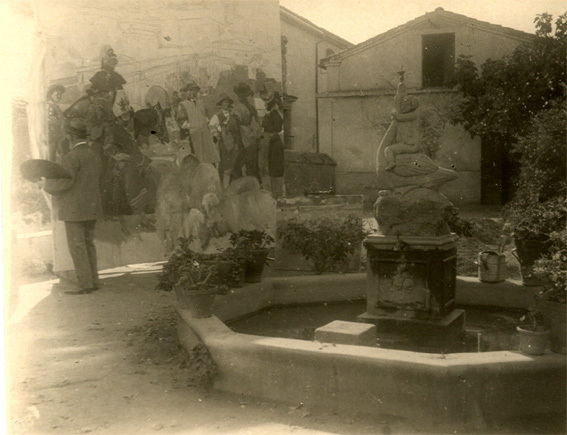 Thanks to Jean Stern, Director of the Irvine Museum, Dan Pinkham, and Arthur Egeli for help researching this. I agree that an umbrella could be helpful, or even just stnding in the shade while you paint, but I don’t think it’s a complete necessity. It seems to me that we can learn to mix colors outdoors while standing in direct sunlight, with enough experience. As you say, definitely no white palettes, and tone the canvas asap to kill the blinding glare. But I work outside quite a bit and never use an umbrella. If I’m staring at an incredibly bright scene, looking at glare on water for instance, and then look into the shade I can’t see anything. If what I’m painting is in bright light, I like to have my canvas and palette also in bright light. Plus I want to have a minimum of gear, and a minimal set up time, and I would rather not have to drag extra equipment along to paint. But I guess that just comes down to whether or not the umbrella is essential, which it is for you. I just thought I would add my dissenting opinion. I’m in Ernesto Nemesio’s class at the academy of art. I just wanted to drop in and say how helpful this blog was before going out to try en plain air for the first time. I got about 6 friends together, went out to a park and had a great time. Thanks for openly and intelligently exploring the approach here as it really helped me understand what I should focus on. I am the unfortunate painter who just imagines an umbrella over my work as it occurs. great info eric, great blog, great work! Tonight was one of those exquisitely beautiful Californian sunsets. As it became much darker, I realized it was the only time I would ever step away from my umbrella to paint. I am lucky enough to be studying with Eric and have experienced first hand the difference between working with and without an umbrella. Out there studying I am becoming increasingly aware of the illimitable colours around me. My eyes are protected from the glare, enabling me to see many beautiful and subtle differences that were previously unclear, (or just down right confusing) standing in the light of the sun or tree shade. The protection of the umbrella (I have one with a dark lining and reflective outer shell) allows me to look at something very bright and then discover surprising colours in the shade. I think if you don’t use an umbrella or haven’t tried to, its worth testing one out. This is a real insightful post Eric. Thanks for going to all the trouble to research this a bit. I agree with Colin on a few points like minimum of set up time and gear. Also, if it is windy it can be a burden. But, after using one for the first time, I can really see how it could allow your eyes to see into color a bit more. I am attracted to painting scenes where I am looking into the sun and I find that it affects my color sense sometimes. A broad rimmed hat can help cut the glare in my face sometimes. Anyway, I have mentioned this post on my blog and linked over here. Eric- routed here from Franks’ blog and thank you for the lengthy and thougtful history and explanation of the whys’of using and umbrella. I was about to order one on line and would probably consider better quality one than the all white sheer version in most of the favorite catalogues. Hey Eric! Good post. An essay really! I’ve tried to use an umbrella but found it to be more of a pain than a help, especially since I like to paint urban landscape plein air and it’s hard to plant an umbrella that won’t blow away when the bus drives by! ahahahaha! Yes, arranging value is what the painter is doing but that happens as much in the mind as on the palette! It occurred to me when I was doing a nighttime plein air… since the values I’m using are ultimately limited from white to black, there are certain ranges that simply MUST work! It’s hard to explain but it was that realization which freed me forever. thanks for this post. i consider an umbrella a necessity and not a luxury. i can paint at all out in glaring sunlite. cant mix or see! “Besides photographic evidence, upon encountering these artists’ beautiful work in person, one realizes that they were obviously using umbrellas of one kind or another to control how they saw.” What is the obvious visual characteristic(s) that lead you to believe the artists were using an umbrella? However I wonder…is color actually a universal language? Two things come to mind in this respect. First, my husband is relatively visually “blind”. What I mean by this is his primary interface with the world is actually not by vision, but sound. He has perfect pitch and has a heightened sense of acoustic interpretation. I believe this to be the case for many musicians. So musicians may “see” the world in acoustics. Secondly, I’ve recently learned of people who have additional visual receptors, enabling them to perceive more subtle color distinctions than the majority of people. While this wouldn’t eliminate color as a universal language, such color discrimination could foster something akin to classism among artists. Thanks for the umbrella post. It was a fantastic read. P.S. I’m on a puppy mission. When I find my puppy, it will be named Winslow, regardless of it’s gender. I’ve never known of anyone named Winslow, prior to this post of yours. Hi everyone and welcome to Edward, Rog, Stephen, Bonnie and Mike, thanks for visiting and leaving your thoughts. My main goal was to get everyone thinking and discussing the idea. For my work, I consider an umbrella as important as anything else I bring along with me. Hi Morgan – that quote was referring to the very subtle color relationships that some of those artists have in their work (in other words, they are seeing and working in wider temperature ranges, warms and cools, without changing value). When you round a corner in a museum and encounter that honesty in a work, it’s incredibly surprising – but not unbelievable. You can’t make that stuff up if you’re working from memory, because memory has certain limitations (defaulting to the brown crayon to make tree trunks, for example). But by being tuned to the landscape and painting what you see, you can find amazing color everywhere. To segue into your other question about color as a language – take a hillside covered in trees, various types. They’re all “greenish,” to use a generic term, but when we look closely, each tree is slightly different. Redder, yellower, etc. The artist needs to be able to find and explain these differences through color; the viewer should then understand the painting, because we all intuitively understand those color relationships. Even if your husband isn’t as tuned in to his color sensitivities (but more tuned acoustically, like you say), I think he should still be able to see the subtle differences in all those trees, both in nature and in a painting. Also, I’ll bet he could tell if a color note in a painting is “off,” just the same way he could tell if a musical note is off. HI Eric, I enjoyed this post. One of my favorite books shows Georgia O’Keefe painting standing up inside a Model T with all the seats except the driver’s removed. I often paint under the lift back of my SUV…how’s that for updating a tradition?. Eric, I received the umbrella from that fisherman’s site you told me about. I’m very pleased with it. The umbrella and carrying case are super light weight . The umbrella is wide and tall and allows no light to come through. Only one problem… I can’t seem to stick it in the hard desert ground! I was able to pitch it on my lawn though. Maybe I should carry a deep can of sand, so I can use the umbrella wherever I please. Hi Robin, thanks for stopping by. Interesting, I don’t think I’ve seen that picture. Hi Silvina – I encounter that problem sometimes too, especially with sidewalks etc. I’ve found that a combination of balancing it against and tying the umbrella to your easel can work alright, as long as there isn’t too much wind. Great post. I wasn’t so much aware as the history as I am the practical experience of painting outside in full sun. Those paintings almost never work out. Didn’t know you were blogging, look forward to more. Thanks for bringing this post together. Indeed, it is an aspect of outdoor painting rarely discussed. Could you recommend any particular umbrella? Perhaps the fisherman’s one mentioned in silvina’s comment? Hi Ed and Kevin, enjoyed your comments. One umbrella that seems pretty good is the ShadeBuddy – you can find it online, but it seems out of stock most of the time. Hi Dan, thanks for visiting, glad you liked it. range of exposure that affects our eyes, and our work. If we only viewed our work in the same conditions we painted it in, then no umbrellas would be necessary to control the light, but when painting outdoors, we are subjected to a variety of light levels. To me the use of an umbrella seeks to create a lighting condition that is closer to the environment in which the work will be seen. Its a very simple tool to balance and control natural light. I was just shopping for a new umbrella, and thought I’d google for other people’s preferences. 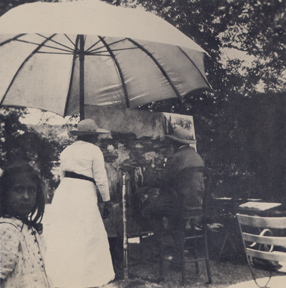 There is a great photo of Sargent painting with an umbrella tied to his leg, btw. There are compelling reasons for using one, but the best way to find out is try painting the same thing in direct outdoor light, and in the shade…. then go look at the results in the studio. Thanks for visiting, and well said. I’ve sewn key-rings onto each of the spoke ends around the circumference of the umbrella so that I can tie a small length of rope with stakes to it. Three stakes seems good to give it a solid stance. I used a triple-staked umbrella to paint in the famous mistral winds in southern France – my umbrella stayed put, but it soon turned inside-out à la Mary Poppins. The other umbrellas mentioned in the comments seem to be some of the best available right now, the ShadeBuddy (though terribly understocked everywhere) and the fisherman’s umbrella, see the link in my earlier comment. I’ve seen the photo of Sargent you mention, plus a few others. He was well documented. It would be interesting to see what other artist photos surface, I’m sure I omitted a few. Hi David, thanks for visiting. Check out the earlier comments for some ideas of where to get umbrellas: the ShadeBuddy is a pretty good bet, and the fisherman’s umbrella (linked above) is good and really inexpensive. A new one that just came to my attention is here: http://www.bestbrella.com. I believe it is made with durable photography gear parts. If you can find one that has the qualities mentioned in the post, you should be good to go. Good luck! where can i find such an umbrella in france?Giverney? !I am an artist who lost his artists umbrella and cannot find another.Am in France until July and then back in U.K.Thank you! Hi Spencer – in France, I don’t know where you could fine one. I shipped mine over with me when I went. The fisherman’s umbrella (linked above) might be your best bet, only $25 and a good deal, they could probably get that to you quickly. I had a buddy look around the London area to see what types of umbrellas were available, but nothing came up that would be good for painting. Maybe there is a Yarka distributor somewhere? Hi Katya, thanks, I’ll have to give it a test run. Looks great, I might have to do an update to this post and mention her new umbrella since folks are still looking for more options. Morgan – I’ve still been thinking about your astute comments to this post; something I could have elaborated on further (and should have included examples of; many Sorollas come to mind) about knowing whether an artist worked under an umbrella/shade of some sort was that shadows from these items are included in the actual painting itself.